Cardinal Seán Brady, a native of Laragh, Co. Cavan, Diocese of Kilmore, was born in August 1939. He was educated at Caulfield National School, Laragh, St Patrick’s College, Cavan, St Patrick’s College, Maynooth, and the Irish College, Rome, where he was ordained in February 1964. He received a Doctorate in Canon Law at the Lateran University in 1967. His first appointment was as professor in St Patrick’s College, Cavan, from 1967-80. In 1980 he was appointed Vice-Rector of the Irish College, Rome, and in 1987 became Rector of the College, a post he held until 1993 when he returned to Ireland to become Parish Priest of Castletara, (Ballyhaise), Co. Cavan. On 19 February 1995 he was ordained Coadjutor Archbishop of Armagh, and on the retirement of Cardinal Cahal B. Daly, succeeded as Archbishop of Armagh and Primate of All Ireland on 1 October 1996. He was installed as Archbishop of Armagh on 3 November, 1996. On Wednesday, 17 October 2007, Pope Benedict XVI announced that Archbishop Brady was to be created a Cardinal. Archbishop Seán Brady was elevated to the College of Cardinals at a ceremony in St Peter’s Basilica, Rome, on Saturday 24 November 2007. On 8 September 2014, the Feast of the Nativity of the Blessed Virgin Mary, the Holy Father Pope Francis accepted the resignation of His Eminence Cardinal Seán Brady as Archbishop of Armagh and Primate of All Ireland. The armorial bearings of the Archbishop show the arms of the Archdiocese of Armagh on one half of the shield and the personal arms of the Archbishop on the other. The Archdiocese of Armagh is represented by the pallium, which is the scapular made of lamb’s wool given by the Pope to symbolise the authority of an archbishop. It will be recalled that it was on a journey to Rome to obtain the pallium that St Malachy died in Clairvaux in 1148. The other half of the shield, Cardinal Brady’s personal armorial bearings, is an adaptation of the ancient shield of arms associated with Mac Brádaigh of Cúl Bhríde, which comprises the district around Stradone in County Cavan. The symbol of the sun, a notable feature of the family arms, has been replaced by a representation of the head of the Cross of Saint Muireadhach, the celebrated scriptural Cross at Monasterboice, which lies within the Archdiocese of Armagh. The shield therefore directs our attention to the Cross – the abiding symbol of our salvation. 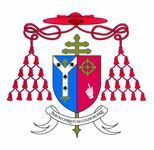 The motto JESUM CHRISTUM COGNOSCERE, (To know Jesus Christ) chosen by Archbishop Brady, is inspired by the words of St John’s Gospel: “Eternal Life is this: to know you, the only true God and Jesus Christ whom you have sent” (17.3). St Paul refers to “the supreme advantage of knowing Jesus Christ” (Phil. 3.8) and insists that he is “preaching a Crucified Christ” (1 Cor. 1.23). Knowledge is the basis of love and the Christian, whether lay or cleric, priest or bishop, strives to know Jesus Christ in order to love him and to preach him.